The battles between East and West Coast have taken us from hip-hop, to higher education, and now onto fast food, with multiple champions sprouting up on either side to vie for the title of best regional chain. But in this case, the challengers-apparent are Shake Shack, the New York "upstart," and In-N-Out, the California heavyweight, and -- being the gentlemen that we are -- we decided to state our cases on both sides of this hot burger issue (especially since, pretty soon, you'll be able to get BOTH in LA). In the end, there can be only one winner, so let us know who that is in the comments, and the loser will be banished from Thrillist, or just embarrassed during happy hours. 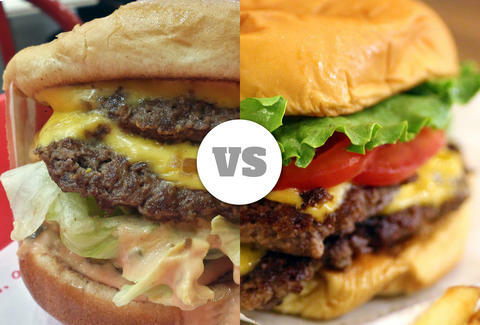 Being a burger lover, you hear a lot about In-N-Out and how it’s supposedly the best fast-food burger in America. Yeah, it’s got legions of fans (read: Californians, who’re always unscrupulously adamant that their state is the best at everything despite being a place where Gwyneth Paltrow’s word is taken as law), a “secret” menu that’s about as clandestine as Joe Biden’s sexual history, and -- wow! -- hats, and those things can’t possibly be denied, right? Wrong, dear reader; In-N-Out’s got nothing on New York burger-slinger Shake Shack, and here’s why. It’s kind of like a cult. You’re handed a plastic tray by a grinning white-and-red-clad twentysomething wearing a paper hat in a pristine 1950s-era hospital setting. Do you take it without first questioning your own sanity? No, you don’t. Its mislabeled “secret” business model is pretty confusing. Proponents of In-N-Out simultaneously laud the simplicity of its standard menu (“Just burgers, fries, sodas, and shakes!”) and the endless customizability of its increasingly bloated “secret” one (“Should I get animal-style, monkey-style, or macaque-style?”) made up of obscure grilled and fried stuff they had lying around. You can’t have it both ways, In-N-Out! Secrets were meant to be kept just that -- you should’ve learned that in fourth grade. Now everyone’s in on it and there’s no sense of exclusivity. As for Shake Shack’s secret menu, well… we’ve already said too much. New York does beef better. Shake Shack’s juicy burgers are made of a blend of genuine Pat LaFrieda brisket, short rib, and sirloin that are delivered fresh daily and griddled to a paragon of crispness. They are unequivocally the best fast-food burger patties on the market. In-N-Out’s burgers are “100% pure beef” and are caked in spices to mask their innate mediocrity. 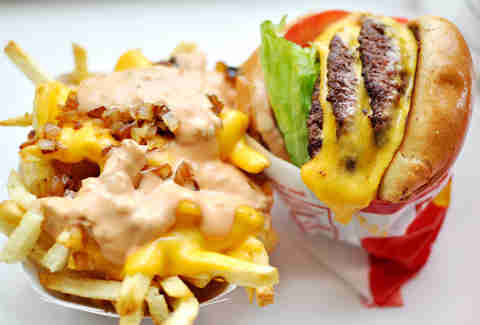 Not to mention the fact that In-N-Out's fries aren't even that good -- and that you pretty much HAVE to get them animal-style as dictated by the freaky West Coast Internet-dominating hive-mind, and also as dictated by the fact that covering them with other stuff is the only thing that makes them remotely delicious. Despite all its “secret” menu additions, it still has fewer offerings. Shake Shack’s menu, in addition to their dope burgers (including an actual vegetarian burger -- take that, In-N-Out grilled cheese! ), fresh-cut fries, shakes, and sodas, also has hot dogs, frozen custard ice cream, concretes (you can even design your own), beer, wine, and an entire section devoted to treats for its customers’ dogs. Who’s a good burger joint? You are! It’s less of a community. You’ll find In-N-Outs dotting the Western landscape, oases of burgers and fries housed in standalone restaurants distinguished by their trademark golden arrow signs. And while that’s nice and all, Shake Shack is even more integrated into the rich patchwork of New York (and everywhere else it has popped up); it’s in our parks, our baseball stadiums, our airports, our malls -- and in all of these places, it’s committed to serving the same incredible burgers, and doing the same good for the people. Plus, Obama eats there, and that guy seems cool. If someone had a gun to my head, and they said, “You’ve got a choice. Either we kill your family, or you can never eat In-N-Out again”, I would never eat In-N-Out again. I mean seriously, I’M NOT A MONSTER. But aside from threatening harm on my loved ones, few things could stop me from eating at what my mom recently called “the good burger place with the weird palm trees”. Now, the other gentleman contributing to this piece has likely tried to convince you that Shake Shack is superior to In-N-Out. He likely made up facts and supported them with other made-up facts and probably mentioned how In-N-Out’s fries aren’t that good, and how they secretly put religious messages on the containers, and how he’s never been to one because no one will invite him to California or even Texas. I don't know for sure, because I'm definitely not going to read his argument. But I do know that he will be wrong, for all of the reasons I will lay out below in bullet points, because I read on the Internet that people on the Internet like bullet points. In-N-Out is not an imitation of another burger chain. In a NY Times story, Danny Meyer -- who grew up in St. Louis -- mentions how he was inspired to create Shake Shack thanks to all the time he spent as a teenager at Steak 'N Shake, and how he “loved how they smashed little disks of beef into delicious griddled burgers.” So he basically set out to create a fancified version of a chain that already exists. You know who inspired Harry and Esther Snyder to create a drive-thru hamburger stand in 1948? THEMSELVES. Or the Lord, or someone. But the point is that they sought to be unique, not to replicate an experience they’d had as a kid. The burger is just better. 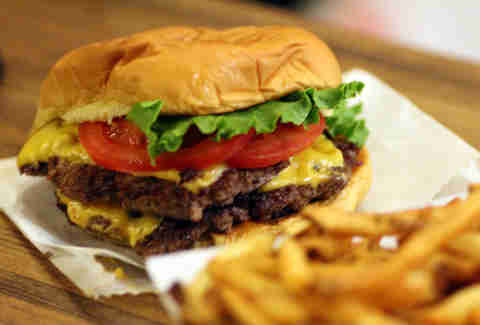 My favorite burger in the entire world is from the White Hut in West Springfield, Massachusetts. It is my dad’s favorite burger, as well, and his dad's, and, well, I think that’s as far as that goes. Anyway, awhile back my dad moved to California, and now he exclusively eats In-N-Out burgers with grilled onions, and nothing else on them because it is the closest thing he’s found to the White Hut, outside of moving back to Springfield and working at the Breck Shampoo factory again, which he doesn’t want to do. And while I don’t have to eat them plain -- in fact I prefer all sorts of alterations, which I will get into next -- they are pretty damn close to the Hut’s griddled, peppery-onion perfection. With that said, it should be known that I like Shake Shack’s burger. I’m not a huge fan of potato buns generally, but the build is solid, and the bun is toasted all buttery, and I dig the sauce and the way it's cooked on the flat top. But the condiments don't feel as fresh and crispy, and the patty isn't as evenly seasoned as In-N-Out's. Plus -- and this is no small consideration -- it’s double the price (okay yes, before people freak out: I understand the Shake Shack burger is more ounces, but even still, it comes out to about $.75 per ounce for In-N-Out, and $1.20 for Shake Shack AND THAT ADDS UP TO MORE BURGERS YOU COULD BE EATING). In-N-Out has an entire Secret Menu. Shake Shack has a secret item. And it’s called the Peanut Butter Bacon Burger. And that’s great for that one time you go, but half the fun of In-N-Out is learning newer and more complex ways to hack their menu. Everyone learns Animal-style first. And then you might learn that you can get the fries well-done (which improves the flavor tremendously, by the way, fry haters!). Or make a black and white shake. And then you learn about mustard-grilled. And whole grilled onions. And the Flying Dutchman. It’s as if In-N-Out is basically the Rosetta Stone of burger shops: they make you learn at your own pace, and pretty soon, you get so advanced that you eventually find yourself saying things like “Cheeseburger, mustard grilled, medium rare, whole grilled onion, extra toast on the bun, with the salad on the side, add pickles and chopped chilies, and cut in half” WITHOUT EVEN THINKING ABOUT IT. And that’s pretty f***ing awesome. In-N-Out will give you a hat if you ask for one. Shake Shack will not. But they will let you buy one for $15 on their website. In-N-Out is privately owned by one family. In 2012, Danny Meyer sold part of his Union Square Events company to Related -- a NY real estate developer with a $15bill real estate portfolio -- with the idea that they could help take Shake Shack global. And it’s worked: they’ve now got Shake Shacks in seven states, as well as the Middle East, the UK, Turkey, and even Russia. Meyer cashed in, but in exchange -- as we all know from that econ class -- there is no way he can maintain stringent oversight of the quality at the Shake Shack in places like Al Ain in the United Arab Emirates or Moscow. Or Florida. Meanwhile, In-N-Out is famous for maintaining its strict adherence to keeping the business in the Snyder family. So you won’t see an In-N-Out in Dubai. Or Florida. Anyway, I could go on and on about other things, like the fact that they pay their managers 100K a year, or that they’ll give you hot peppers in a little baggie on the side, or that I once went on a date with a girl with whom I had no chemistry strictly because she offhandedly mentioned that she knew all of In-N-Out’s secret menu items, but the point’s been made. Come with me, friends. Come to the In-N-Out side. I’ll even save you a hat. Kevin Alexander is Thrillist's food/drink executive editor and Adam Lapetina's boss, so Adam better play it really cool for the rest of the week. REALLY COOL. Follow Kevin to blissful Double-Double glory at @KAlexander03, and Adam to Shake Shack's concrete(s) jungle at @AdamLapetina.